Providing you the best range of stainless steel airport chair with effective & timely delivery. 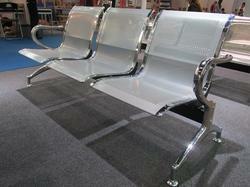 We are offering Stainless Steel Airport Bench to our customers. Beam: 2.0mm thick triangle steel tupe, outdoor air-conditoner paint is applied,resisting the wind, rain and sunshine.